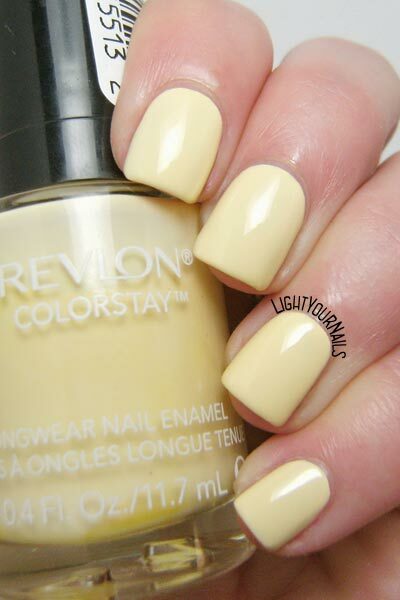 Revlon Buttercup | Light Your Nails! Quick post today to show you swatches of Revlon Buttercup, a pastel yellow nail polish. Formula is watery but dense at the same time. You don’t expect anything different from a pastel nail polish though. And it’s not the worst I’ve ever tried anyway. You need two coats for full coverage, plus a top coat to smooth the surface. It’s such a perfect shade for Spring and for a variety of nail arts. Let’s say I love the colour but I’ll keep looking for a dupe with a better formula. What do you think about it? Would you wear it? Don't you find it hard to apply? Ottimo per nail art pasquali! I can guess it Ria! I don't surrender though! I'd wear it! That yellow is so soft. It's always something with pastel formulas, though, I totally agree. I'm shocked that you were able to get that opaque in two coats! Normally I have to do three for most pastels. But, that shade looks really pretty on you! This one is surprisingly opaque I must say! I think it is cute! I would definitely wear it. It's beautiful! But these shades tend to have awful formulas.. they should really do something about that ;) Can't wait to see the nail art though! The nail art was a fail, I don't think it will ever make it to the blog! Vero!! Anche io adoro giallo e blu, e anche giallo e grigio! It is very pretty and delicate shade. I agree Vedrana! It's very light and delicate. To be totally honest i have never worn a yellow nail polish in my entire life! Yellow are my Mothers favourite shade and i do have only ONE shade of this polish in my drawer, think i must give it a go at some stage. I'm not such a big fan of pastels, but once in a while i would paint my nails with them. I think yellow is a very underrated shade so I totally understand. I am no fan of pastel yellows alone, although I'd need a good one for nail arts. I love bright yellows creme though!